At the end of 2009, Forrester expects mobile Internet penetration to reach 17 percent in Western Europe, the same adoption rate for the PC Internet a decade ago. If the growth rate remains the same, mobile broadband would hit something on the order of 60 percent to 70 percent penetration in 10 years. That would make a shambles of efforts to quantify broadband penetration in Western Europe, as similar trends in the U.S. market likewise would make most current concerns about broadband penetration likewise irrelevant. We have seen this sort of thing before in the global communications business. Policymakers used to wring their hands about voice penetration in developing countries. But monthly costs of $5 to $10 a month now are making mobility the way many people are getting access to voice. Increasingly, wireless handsets will be the way most people in developing regions get access to Internet communications and applications as well. U.S. policymakers thought a major revamp of communications policy would spur competition in voice, almost precisely at the point that Internet applications were about to make those concerns, if not moot, then of much-lesser concern. Forrester expects mobile Internet to grow to 39 percent penetration by the end of 2014. That's a lower end point than for the PC Internet in 2004, but the growth curve per se looks quite the same, Forrester Research says. If you have looked around the table at your last conference room meeting, you have noticed that netbooks already have grabbed significant user share. A new study by NPD Group confirms the traction. In the second quarter of 2009, the netbook segment grew 40 percent sequentially, while notebook sales grew 22 percent sequentially. In some markets, such as China and Latin America, netbook sales already are greater than notebook penetration. Still, the installed base of netbooks is about 22 percent of the portable computer market. Asus, the pioneer in mini-note PCs, has been steadily losing share because tier one brands like Acer, HP, Dell, Lenovo and Toshiba have become increasingly aggressive in the segment, NPD Group says. In many regions, telecom providers have been offering subsidized mini-notes for several quarters, which helped propel growth. In Western European countries, a number of telecoms are subsidizing 100 percent of the price of the mini-notebook devices when the customer signs a two-year data plan contract. Mini-notebooks have been a significant contributor to the growth in the portable PC market as their very attractive price points make owning a secondary computer viable for many consumers. Suppliers generally seem to be differentiating notebooks from netbooks by screen size. At about 12 inch screen sizes, netbooks start to overlap with notebooks. Some suppliers likely want to increase average selling prices for netbooks, but price is probably the reason so many netbooks have been sold. 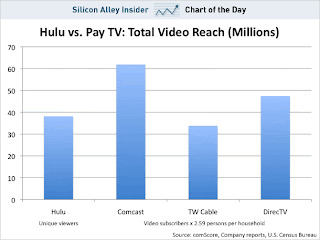 There's one take-away we ought to gain from looking at the number of subscribers to multi-channel video entertainment services or users of Hulu. And the take-away is that Hulu cannibalizes pay per view or on-demand programming or digital video recorder income that otherwise might be gained by linear video providers. On the other hand, we might also note that the revenue potential to be gained from time-shifted services is not all that great at the moment. The issue is much the same as now experienced by content publishers in most other areas. Namely, that although online distribution costs are lower, revenues are much lower. There remains a revenue gap for online distribution compared to legacy distribution that is not yet fully understood, yet. Some service providers think the answer might be "TV Everywhere," where a user paying for a linear video subscription can watch that content on mobiles or broadband-connected PCs. The business issue there is just about as challenging: the revenue comes from keeping a multi-channel video subscription. Most of the rest of the distribution is just cost. The video business is different from the music business in one significant respect: where people routinely prefer to own their personal collections, they rarely want to "own" news, sports and most serial TV fare. That has some fairly signficant implications for business models. "Buy to own" makes logical sense for consumers of music. "Rent to view" makes more sense for most video and movie fare. The historic example is the difference between adoption of cable TV and adoption of subscription music services. There are perhaps 20 million XM Sirius subscribers, compared to 63 million cable TV subscribers, plus three million telco video subs and 31 million satellite TV subscribers. In other words, there are 97 million video subscribers, compared to 20 million XM Sirius subscribers. Most video watchers want to see news, sports and other events only once, movies once or twice. Most music listeners want to own and listen to some favorite songs over and over again. That suggests a stronger market opportunity for video subscriptions, compared to music subscriptions, and a larger market for on-demand video than on-demand music streaming. iPhone to Go Multi-Network in 2011? One likely would bet against Apple extending its exclusive U.S. distribution deal with AT&T past 2010, based on market share statistics gathered from around the world, including markets where Apple has an exclusive carrier partner as well as markets where Apple has a multi-partner distribution. Consider the Frech market, where Apple has multiple distributors. "In France, the company now enjoys dramatically higher market share (in the 40 percent range vs. about 15 percent in ROW) than in countries with exclusive carrier agreements (such as AT&T in the U.S. where the iPhone has market share in the mid-teens).Gene Munster, Piper Jaffray senior research analyst. Those market penetration figures should prove more compelling than the lower revenue per iPhone unit Apple gets in countries with multiple distributors, Munster argues. One never should mistake media hype for end user reality. At the moment, perhaps 10 percent to 11 percent of U.S. adults actually use an iPhone, a BlackBerry or any other "smart phone." Most of the market has yet to adopt any smart phone. Conversely, the mass media, and some within the specialized communications media, continue to insist that there is a major problem with broadband access. There are isolated issues, to be sure. But 70 percent of U.S. adults now use the Internet. Average household size is about 2.59 per home. About 74 percent are 18 or older. So adjust the household stats to 1.9 adults 18 or older per home. Assume those 1.9 adults share a single fixed broadband connection at each location. In other words, a 70-percent "per capita" use of fixed broadband does not directly translate to "70 percent household penetration." Conversely, 30 percent of U.S. adults do not use the Internet, according to Rubicon Consulting. Assuming those non-Internet-using households have the same average size as Internet-using homes, one might roughly assume that broadband penetration of U.S. adults is less than 70 percent, as studies suggest perhaps six to 10 percent of Internet users use dial-up connections. Assume dial-up households also have the same size characteristics as Internet-using and no-Internet households. Then we might argue that between 60 percent and 64 percent of U.S. households now buy fixed broadband service. But those 60 percent to 64 percent of U.S. homes represent more than 90 percent of all Internet users. In fact, if one adds users who use broadband at work, at libraries, using public Wi-Fi or mobile broadband, it is likely that more than 95 percent of all Internet users in the U.S. market already use broadband access the way they would prefer, given all their other buying choices. The point is simply to keep in imind that what people talk about in the media is not necessarily fully reflective of reality. Smart phone uses are starting to self sort themselves by lead application, it now appears. Though much could change as adoption becomes more mainstream, it now appears that Apple iPhone users value Web access while RIM BlackBerry users value email. To a lesser extent, Palm users favor calendar apps. Patterns for users or Microsoft and Android operating system devices are less distinct. But that might be one reason new sales of Microsoft-OS devices are declining, relative to others. To the extent there is any distinction, Google G1 users put heavier emphasis on maps. The clearest example that users are segmenting themselves by applications is that "the best-selling smartphones are the ones that most strongly associate with one or two particular features," says Michael Mace, Rubicon Consulting principal. BlackBerry and iPhone each have one or two standout features that more than half their users rank as extremely important, he says. As you would expect, email access is unusually important for BlackBerry users. BlackBerry users are also much more interested than average phone users in web browsing and calendar. Blackberry users are substantially less interested in price, size of the phone, and address book management. The priorities of iPhone users are dramatically different from either typical mobile phone users or RIM users, says Mace. Browsing was the iPhone users’ top feature, followed closely by email. But iPhone users were much more interested than RIM users in music, maps, 3G, and the ability to add new software. The Windows Mobile user profile is similar to that of the BlackBerry, but less distinctive, says Mace. The priorities of Windows Mobile users are similar to Blackberry users, with the exception that Windows Mobile users are a bit less focused on email and more interested in adding new software and using maps. But no single feature was noted by more than 40 percent of Windows Mobile users, indicating that it doesn’t have a very distinct feature identity in the market. Palm users were also somewhat similar to RIM users, with the exception that they were quite a bit more focused on calendar functions, which was cited as the number one feature. But compared to Microsoft users, email and browsing were ranked less hihgly. "It appears that RIM and Apple are siphoning off most of the people who care the most strongly about browsing and mail," says Mace. "Calendar scored higher among Palm users than among any other platform, which probably fits with Palm’s roots as a PDA company," he notes. But Palm application patterns do not have as distinct an identity as Blackberry and iPhone do. Compared to all the other smartphones, the Google G1 “GPhone” has the least distinctive feature profile. It is cited for maps more than any other phone, but only 30 percentof users call that a top four feature. Relatively few G1 users said browsing is a high priority. Instead, browsing ranked far below iPhone, and on a par with RIM. That may indicate that the marketplace has not yet decided what an Android device "is." BlackBerry is email, iPhone is Web browsing. Neither Palm, Microsoft nor Android seem yet to have grabbed a clear and distinct niche within the smart phone market. These findings are important for very broad reasons. I have long argued that voice is, in fact, not a "commodity." The latest Rubicon findings suggest that mobile phones and smart phones likely are not true commodities either. At least in the case of the BlackBerry and iPhone, users have self selected themselves based on behavioral differences. If that is true, it also should be true that service plans, application optimization and other ways of appealing to a distinct market niche are possible. The Rubicon findings also suggest it is important for Microsoft, Palm and Android to find and cultivate a distinct market niche. So far, none of them seems to have succeeded to the degree Apple and RIM have. In other words, there is no such thing as the "best smart phone" for every user. That decision depends on what one wants to do most. Smart phones are becoming more like automobiles, in that sense, then has been the case in the past. Roadsters, vans, trucks, subcompacts, SUVs and full-size passenger vehicles have different "lead" applications. 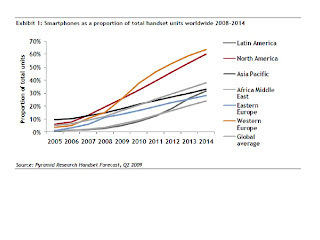 So, increasingly, do smart phones. The key insight here is that communications products and services are less commoditized than most of us typically assume. It might be hard work to differentiate, but it can be done. Perhaps the worst case scenario would be for most smart phones to ultimately be seen as general purpose mobile PCs. That would destroy the ability to differentiate. Summer normally is a time of reduced video viewing, as users are out and about. But online video viewing was up 14 percent year over year in June, according to The Nielsen Co. But it appears unusual news events, not a permanenet change in behavior, account for the upsurge. Unusual media events, including the memorial service for Michael Jackson and the civil unrest in Iran, likely were driving the heavier usage, comScore says. Is there a business model for mobile TV? The number of mobile TV users continues to grow but there is still no proven business model so far to market the service, researchers at Infocom say. "Japan, South Korea and Italy are the leading markets for broadcast-based mobile TV services but mobile TV subscriber growth in these markets is driven mainly by free or partly-free access and rather large handset availability, Infocom says. Much could change with time, but there are some features and services for which there is in fact no apparent stand alone business model. Consider the Wi-Fi hotspot business. For an increasing number of service providers, the business model is fixed broadband, and Wi-Fi access is simply an added feature of the broadband service. The same thing appears to be happening in the multi-channel video business, as service providers test the idea of "TV Everywhere," where paying for a fixed video subscription also allows access to video from PCs and mobile phones. Advertising might help, but possibly not as much as people suppose. At this point, it appears possible that the mobile TV business model is fixed network multi-channel video, much as Wi-Fi now is a feature available to broadband access subscribers. Can Open Access FTTH Work? Open access can work for fiber to home access, says Yankee Group analyst Benoît Felten. Most observers might tend to agree that the thesis works better in countries without robust cable TV broadband penetration, where construction costs are high and where regulators allow a reasonable rate of return on wholesale activities. Felton argues a wholesale approach does not reduce overall take rates or average revenue per user for the network owne, an assumption that obviously makes better sense where virtually all retailers use a single access network. "When DSL networks started opening in Europe in 2002 to 2005, although there was often a small impact on the incumbent’s ARPU in the early stages, that ARPU climbed back to its pre-unbundling levels within a few years due to offer differentiation and the development of value-added services. Incumbent retail market share of course drops. Felton notes that very few incumbents in Europe currently have less than 50 percent market share of broadband, and there is little reason to think that opening the DSL network has impacted their ARPU or penetration negatively. What is different about U.S. markets, however, is that cable competitors have their own, ubiquitous networks, with a majority of market share for video and broadband access services, with growing voice share. For this reason, U.S. incumbent telcos cannot hope to serve perhaps half of all retail broadband or video providers, and perhaps 20 percent to 25 percent of all voice retailers. "What we are saying is that our economic analysis suggests that having more than one fiber infrastructure in the ground is hard to sustain," says Felton. More than 80 percent of online Americans are active in either creating, participating in, or reading some form of social content at least once a month, say researchers at Forrester Research. About 24 percent of online users create content, while 37 percent post responses. About 21 percent use real simple syndication. Some 51 percent maintain personal profiles. Fully 73 percent of online users read blogs, watch online videos or listen to podcasts. Among online users 35 or younger, social networking is nearly universal, with 90 percent participating in some way. Among those 55 and over, about 66 percent now are participating. Beginning September 6, 2009, AT&T will mandate subscribers who activate or upgrade to a smartphone to also pick up a data plan. One might argue that a smart phone without a data plan is about as useful as a PC without an Internet connection, or a TV without access to a multi-channel video plan. Beyond that, as the mobile industry transitions to a revenue model based on data plans, not voice, the move is to be expected. There is no inherent reason why the cost of access to the global network, which increasingly includes Web services, should be based on use of voice applications. On the other hand, users who simply want access to voice or text messaging only need phones with that basic level of functionality. Will AT&T Wireless Support VoIP? For Apple and Google, the recent inquiry by the Federal Communications Commission into VoIP blocking on iPhones and Android devices is a reminder that the communications business is rather more suscepible to political pressure than the software business. For AT&T the inquiries are just part of the background of doing business, but AT&T's response to the FCC inquiry suggests that what typically happens, will happen again. Namely, when regulators decide it is time to do something, market contestants typically try to head off more onerous rules by making voluntary business decisions that reduce the need for such rules. So it is that AT&T now says "we plan to take a fresh look at possibly authorizing VoIP capabilities on the iPhone for use on AT&T’s 3G network," says Jim Cicconi AT&T Services senior EVP. That doesn't guarantee clearance for unlimited VoIP use on AT&T mobiles, but it is a sure sign AT&T does not want to regulated into such a position. Any active U.S. service member with a .mil email address can sign up for a Google Voice account at and start using the free service within a day. It's a good thing. As Apple now it admits it alone was responsible for the initial rejection of the Google Voice app for the iPhone, and AT&T reaffirms that it had no say in the decision, Google has found itself in a bit of the same position as Apple, as Android mobiles are alleged to use a "less than fully functional" version of Skype on Android devices. Some have suggested that Skype had been similarly blocked from Android phones, but the issue really is the functionality of Skype on Android devices. Google says on its blog that the Android operating system did not, at first release, support any full-featured VoIP applications. That now has been rectified, Google says. That said, both Apple and Android devices are subject to any existing carrier policies on use of VoIP over their mobile networks, though it does not appear any such policies are involved either in the initial attempt to make Google Voice available on the iPhone, or the initial attempt to get a full-fledged version of Skype running on Android devices. So it turns out AT&T was telling the truth all along: it had nothing to do with Apple's rejection of the Google Voice application for the iPhone. "Apple is acting alone and has not consulted with AT&T about whether or not to approve the Google Voice application," Apple says on its Web site. "No contractual conditions or non-contractual understandings with AT&T have been a factor in Apple’s decision-making process in this matter." AT&T has been insistent on this from the start of the controversy. "Let me state unequivocally, AT&T had no role in any decision by Apple to not accept the Google Voice application for inclusion in the Apple App Store," says Jim Cicconi, AT&T senior executive vice president for external and legislative affairs. To be sure, Apple claims the rejection of the application was because of user interface implications, not a blanket rejection of VoIP or Google's approach to providing services, which is better described as Web activated than VoIP. Apple says it has not rejected the Google Voice application, and continues to study it. The application has not been approved because, "as submitted for review, it appears to alter the iPhone’s distinctive user experience by replacing the iPhone’s core mobile telephone functionality and Apple user interface with its own user interface for telephone calls, text messaging and voicemail," Apple says. "AT&T was not asked about the matter by Apple at any time, nor did we offer any view one way or the other," Cicconi said in a statement, accompanying a response to a regulatory inquiry into the rejection of Google's voice application by Apple. On an iPhone, the “Phone” icon that is always shown at the bottom of the Home Screen launches Apple’s mobile telephone application, providing access to Favorites, Recents, Contacts, a Keypad, and Visual Voicemail. The Google Voice application replaces Apple’s Visual Voicemail by routing calls through a separate Google Voice telephone number that stores any voicemail, preventing voicemail from being stored on the iPhone, Apple says. "In addition, the iPhone user’s entire 'Contacts' database is transferred to Google’s servers, and we have yet to obtain any assurances from Google that this data will only be used in appropriate ways," Apple says. AT&T, Apple and Google have been asked by the Federal Communications Commission for clarification of the issue. What is interesting is that most observers seemed to think AT&T was behind the ban, attempting to protect its mobile voice business. Some suggested Apple was developing its own voice service. To be sure, the wording of the Apple statement seems to imply that if the user interface issues and data privacy issues can be worked out, that the Google Voice app would be reconsidered. In fairness to Apple, its stated reasons for rejecting Google Voice--user interface and functionality--are things the company tends to be meticulous about. Given Apple's past fastidiousness on that score, the initial rejection is not unusual. What remains to be seen is whether Google Voice can be reconfigured to Google's satisfaction, as well as to Apple's. The big news is that AT&T was not involved in the decision. Feature phone sales fell five percentage points to 72 percent of new handset sales in the second quarter of 2009, while sales of new smartphones reached 28 percent of overall consumer purchases, a 47 percent increase in the category’s share since last year, according to The NPD Group. Lower prices appear to be the reason. “Despite their ties to pricey data plans, the rich Internet access capabilities of smart phones are attracting consumers wooed by lower device prices,” says Ross Rubin, NPD Group director of industry analysis. Overall handset sales volume in the U.S. grew 14 percent year over year in the second quarter, as sales revenue increased 18 percent. The average selling price of all mobile phones increased four percent year over year, reaching $87. Wi-Fi capability increased three-fold since last year, with 20 percent of all new handsets equipped with this capability. Touch screens on both feature phones and smartphones grew to 26 percent of all new handsets purchased in the quarter. QWERTY keyboards were available in 35 percent of handsets sold. In some ways, the differences between feature phones and smart phones are decreasing, NPD Group says. Former VocalTec CEO Elon Ganor has started a new company, Nucleix, in the life sciences area. 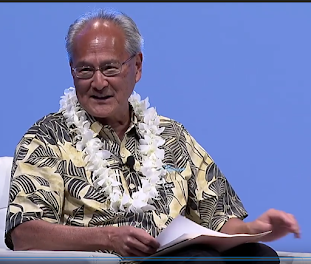 You might say it is a case of an entrepreneur doing wht entrepreneurs do: start new companies. Though anecdotal, you might also conclude something else: venture capital is looking at life sciences more than VoIP, and entrepreneurs are responding to what they see as higher-growth, more-lucrative fields. It's anecdotal, but possibly telling. Lots of others are focusing on micro-blogging or wireless, especially mobility applications. Rural Broadband Penetration Close to 100% of Internet Users? Use of broadbnd in rural areas now is close to 100 percent of Internet users, new data from comScore suggests. In 2007 the U.S. Department of Agriculture Economic Research Service estimated that 63 percent of all rural households had at least one member access the Internet. If rural broadband penetration now is up to 75 percent, as comScore indicates, that would imply that Internet usage is at least that high, allowing for some households that continue to use dial-up access. That would seem to have implications both for setting of national broadband policy and policy in rural areas. For starters, the new data suggest that rural broadband is growing robustly, without any additional government activity. Some might argue that broadband usage remains lower in rural areas than in metro areas, and that remains true. Metro broadband penetration is at 89 percent. But virtually every study has shown that Internet usage also is lower in rural areas. Broadband pentration in U.S. rural areas increased 16 percent from 2007 to 2009, while metro area broadband penetration grew 11 percent, according to comScore. In part, that is because rural markets have more room to grow. The analogy is wireless voice growth, which is highest in places such as India, China and Africa, where penetration is lowest. “With low-speed DSL priced at about the same level as dial-up in many areas, there is little incentive for households to remain on dial-up,” says Brian urutka, comScore VP. Rural markets with a population less than 10,000 grew broadband penetration by 16 percentage points. Areas with population between 10,000-50,000 grew penetration 14 percentage points while metropolitan areas with populations of 50,000 or more grew penetration by 11 percentage points. Critics sometimes say that even if access is not a problem, access speeds are, and that is an argument that makes more sense. The issue there, though, quite often is the "middle mile" trunking between major points of presence and the actual rural communities. Basically, the problem is not the Internet backbones, and not even so much the local access networks, as it is the trunking network to backhaul traffic to the Internet PoPs. Many rural ISPs find, for example, that they have access to a T1 or two T1s in the middle milde. That makes it tough to deliver faster broadband access to customers on the local access networks, for obvious reasons. The Internet backbone is a firehouse. So are the access networks, for the most part. But the middle mile is a straw. That isn't to say there are no communities or isolated locations without broadband access availability from at least one terrestrial provider, and two satellite providers. It is to point out that the "problems" often have more to do with trunking facilities than local access, and that any gaps between urban and rural use of the Internet and broadband are rapidly closing. There is fairly broad agreement among chief marketing officers at global telco, cable, wireless, satellite, Internet service provider and long distance carrier firms that competition is having a huge effect on customer retention, acquisition and broad company strategies, primarily affecting product pricing and customer retention. Over 84 percent of respondents to a survey conducted by the CMO Council report increases in the cost of acquiring and sustaining customer relationships and, not surprisingly, 63 percent are seeing higher rates of customer churn and attrition. The new global study by the Customer Experience Board of the Chief Marketing Officer Council also shows that price competition, for example, now is a chief issue. According to 55 percent of respondents, emerging competitors and market disrupters are undercutting or discounting prices, with an additional 37 percent indicating these contenders often target the most lucrative customers. So there's a new focus on customer experience, as satisfying and retaining current customers is three to 10 times cheaper than acquiring new customers, and a typical company receives around 65 percent of its business from existing customers. service, McKinsey says. And the small number of customers a firm normally hears from are typically just the tip of the iceberg. because they perceive an attitude of indiff erence in the owner, manager or employee, researchers at the University of Pennsylvania. In a more-crowded and competitive environment, 56 percent of respondents also say they are finding the task of creating brand preference more difficult. In fact, creating a differentiated presence in the marketplace was seen as the top challenge, overall. But 55 percent of respondents also say the need for innovation, price pressures and competition from new and adjacent competitors is among the top-five challenges. About 47 percent of surveyed executives say the need to rapidly develop new services and applications was a top concern as well. Churn likewise was seen as a top issue by 40 percent of executives. Also, 66 percent of executives say churn rates are increasing. One major trend of key importance for operators of wired networks is a shift to increased wireless dependence, as 36 percent of marketers see a growing shift to wireless-only households and 32 percent see a trend towards wireless dependence for life, work and community tasks. Recession-hit consumers would sooner give up vacations and dining out than spend less on communications services, Ofcom, the U.K. regulator says. While 47 percent of people would cut back on eating out and 41 percent on vacations, just 19 percent would lower their mobile spending , 16 percent their TV subscriptions and 10 percent broadband. And while customers are making adjustments, those attitudes seem to mirror what we also have seen in the U.S. market. Those findings are roughly in line with recent surveys of U.S. consumers, which tend to find that broadband access is the single most-important service. Does Netflix Model have Legs? One of the enduring lessons of new technology adoption is that the transition from older patterns to newer patterns can take quite a long time. One of the other lessons is that older ways of doing things sometimes do not fall before the new. There was a time when TCP/IP was considered a transitional signaling method that would be replaced by the open systems interconnection model promulgated by the International Organization for Standardization. That never happened. There was a time when Integrated Services Digital Network was seen as a replacement for time division multiplexing networks, on the way to a next generation network based on B-ISDN using asynchronous transfer mode. ATM proved a modest success, but has been eclipsed by IP. Everybody "knows" that linear video will someday soon be eclipsed, possibly replaced by, Internet-delivered video, consumed on an on-demand basis. So far, that transition is proceeding slowly, which is typical for most technology substitutions. What is more interesting: the extent to which the Netflix "DVD by mail" channel has more legs than people suspect. Though both the Blockbuster retail model and the Netflix models have been considered "toast" for some years, Netflix keeps defying expectations, even as it readies itself for the digital delivery shift. Kaufman Bros. analyst Aaron Kessler has raised his rating on Netflix to "buy" from "hold," based at least in part on a survey of 700 Internet users, which found that 20 percent of all respondents that aren’t currently Netflix subscribers plan to sign up for DVD by mail service in the next five years. Repeat: "five years." Kessler argues that, over the next five years, the country as a whole could reach near 20 percent Netflix subscription penetration. The “DVD by mail life cycle may be longer than current thinking,” he says. “While we would agree that a large percentage of the DVD rental market will move to digital in the long term, our survey indicates that the current life cycle of physical rentals may be longer than people think." Specifically, 68 percent of respondents indicated that “the ability to watch videos on the Internet versus renting from a physical store or by mail” is not important to them. About 26 percent said online video was "somewhat" important and only six percent said it was " "important." Ultimately, much will hinge on how broadly content owners and ISPs support Internet delivery, as well as pricing models they choose to employ. But it is worth noting how indifferent most users say they are to Internet-delivered on-demand programming compared to retail rental or DVD by mail alternatives. In the communications and computing business, one always has a fundamental choice: substitute local processing for remote processing, and local storage for remote storage. In other words, one always can make an engineering trade off between communications and local processing and storage. The "DVD by mail" alternative substitutes local processing for communications (physical media is an alternative to network delivery). Online video substitututes communications for local resources, in the same way that "broadcast" video substitututes communications for local processing and storage. Though the conventional wisdom is that users value and want on-demand video, Kessler's survey suggests otherwise. Users don't care as much as we sometimes think. Unlike news, sports and other "real time" content, where immediacy, in fact "shared experience" is important, movie content can be time shifted, place shifted or device shifted with little apparent downside. That suggests demand for news, sports and other "real time" content will shift to online faster than "non-real time" pre-recorded video. All of which is a reminder that we all have to be careful about assuming we know very much about what users actually want, how much they value various delivery and consumption channels and what they are willing to pay for experiences. Netflix might prove to have a longer-lasting future than most of us now think. But that has been true for several years. Might the same be true for other applications and services most of us assume are "toast?" Internet advertising is just as effective, if not more effective, than traditional TV advertising, comScore has found in a recent study. Over the course of twelve weeks, online ad campaigns with an average reach of 40 percent of their target segment successfully grew retail sales of the advertised brands by an average of nine percent, says comScore. This compares to an average lift of eight percent for TV advertising as measured by Information Resources, Inc.
About 80 percent of the Internet campaigns showed statistically-significant sales lift, compared to 36 percent of the TV campaigns, comScore says. The comScore research was based on results from 200,000 panelists who are members of supermarket loyalty programs and whose retail buying behavior was measured through point-of-sale UPC scanners when the panelists presented their membership cards at the checkout lanes of participating supermarket stores. Those results are for campaigns supporting consumer packaged goods. It is not clear how business-to-business campaigns might compare. There's a bit of a cloud now hanging over the mobile prepaid segment as some larger prepaid providers have reported financial results that indicate slower growth. Most-recent MetroPCS, Leap Wireless and Virgin Mobile USA quaterly results show slower customer growth. This will bear watching. Prepaid had been on a tear over the last year or so so investors are a bit rattled by the slowdown. Prepaid wireless has been much more popular in Europe and elsewhere in the world than in the United States. About 19 percent of U.S. accounts are billed using prepad mechanisms, according to Pali Research. In Western Europe, the prepaid share of total mobile connections varies significantly by country, but on average it was 57 percent at the end of 2008, according to the Yankee Group. That might decline to 47 percent by 2013. In developing markets, prepaid dominates. For example, in Latin America prepaid accounts for 84 percent of mobile connections today. Yankee Group is predicting this percentage will remain flat during the next five years. There are a couple of big questions about the U.S. market. The first is whether users who seem to be migrating to prepaid because of the recession will stay in prepaid mode after the recession ends. The other question is whether the market segments prepaid represents will change. Up to this point prepaid has been aimed at a lower-income user. But wtih the growth of prepaid unlimited plans in the $45 to $50 range, one wonders how long it can be before smart phones start to become available, enticing users that would otherwise be buyers of post-paid service. Is “Developing Market” a meaningless term where it comes to use of the mobile Web? Declan Lonergan, Yankee Group analyst, thinks so. That doesn't mean the markets are identical. Developing markets rely on handsets whose monthly cost is $5, developed market users often pay $40 to $80 a month. Despite those differences, consumers everywhere want access to the mobile Web. When they get it, their usage profiles are surprisingly consistent, Longergan says. The top 10 countries for Opera Mini usage during June 2009 were Russia, Indonesia, India, China, Ukraine, South Africa, U.S., U.K., Poland and Nigeria. India continued to move up the rankings, overtaking China for third place, Opera reports. These results demonstrate the huge appetite for access to the mobile Web in developing markets. Yankee Group in 2008 found use of the top-10 most popular mobile phone services were almost identical in developed and developing regions. Penetration of mobile Web browsing in the Gulf (11 percent) and in Europe (14 percent) was also very close. América Móvil (AMX) as a point of reference. AMX is a leading provider of mobile services in Latin America, with subsidiaries in 18 countries including Brazil, Argentina and Colombia. As of June 30, 2009, it had more than 190 million mobile customers and three million land lines in the Americas. In most countries, AMX targets primarily low-ARPU prepaid customers. It has 42 percent mobile customer market share in Latin America. Its closest challenger is Telefonica with 29 percent. The differences between developed and developing markets are small, Lonergan says. The most successful services are consistently messaging (dominated by SMS), mobile broadband, personalization (ringtones) and mobile Web. Mobile Web use is being driven by consumers accessing social networking sites like Facebook. AMX is emphasizing mobile social networking by providing access to brands like Facebook, MySpace and Orkut (Google) in Brazil. It also offers branded chat, photo and video blog services. AMX’s subsidiaries Telcel and Comcel provide public photo- and video-sharing sites. Telcel offers a B2C interface that allows amateur contributions to be uploaded and purchased. The most frequently visited sites by customers using Vodafone’s mobile Internet service are Facebook, Google, BBC, YouTube, Windows Live, Bebo and eBay "We can conclude, therefore, that operators in developing and developed markets are offering broadly similar MI service portfolios," says Lonergan. But some differences will persist, particularly when we focus on the least advanced markets. The use of SMS is one example. In sub-Saharan Africa, SMS remains a critical platform for service innovation and will continue to be the focal point for local entrepreneurial initiatives. Mobile data services account for 15 percent of AMX’s revenue today while European operators typically achieve 20 to 30 percent. "In our conversations with various players throughout developing regions, we have heard evidence of average consumption of up to 1.5 GB per month per user," says Lonergan. "This is close to levels generally seen among low-end users on land line connections." How Long Before Mobiles Eclipse PCs as Internet Platform? It long has been the conventional wisdom that mobile phones will be the way most people in developing markets access the Internet. And though that likely will not prove true in developed markets, it does seem inevitable that a significant percentage of total Internet and Web usage originates from smart phones. Whether it is ultimately 25 percent or 50 percent of usage that is initiated from mobiles is not clear. What is clear is that the percentage of Web and Internet application usage from mobiles is growing with no natural limit in sight. And at least some observers think 2010 could be the year more sessions originate from mobiles than from PCs. To be sure, that prediction assumes heavy use of social networking, instant messaging and other communications activities, plus Web-based entertainment, will drive mobile Web activities. The prediction likely would not be correct if one counted the length of sessions or Web browsing activities. But social networking is an application growing fast, and which is ideally suited for mobile sharing and updating. Demand for smart phones will make up 70 per cent of new device sales by 2012, while sales of "mid-tier" feature phones declines, according to researchers at Gartner. Worldwide mobile phone sales totalled 286.1 million units in the second quarter of 2009, a 6.1 per cent decrease from the second quarter of 2008, but smart phone sales surpassed 40 million units, a 27 per cent increase from the same period last year, representing the fastest-growing segment of the mobile-devices market. Though major telcos and cable companies, as well as many independent rural telcos seem to be passing on applying for broadband stimulus funds, it appears wireless firms are active. Leap Wireless says it has applied for a grant to supply 23,000 low-income families in Baltimore, Houston, Memphis, San Diego and Washington, D.C. broadband access and digital literacy training. Yonder Media, a Reno-based wireless broadband provider to rural communities, also has applied for funds to deploy 150 3G rural wireless broadband networks, serving 400 communities. Qwest, Comcast, AT&T and Verizon did not apply, and that was not unexpected. The Rural Utilities Service rules generally bar firms such as Qwest from applying for support for their rural operations if they also serve at least one metro market in a state. And none of the major providers were too happy about strings attached to the receipt of funds, which affect the business models and practices the companies can use. Level 3 Communications likely will apply for funds to support middle-mile facilities that can be used by local access providers. Sprint Launches 4G in Las Vegas, Atlanta and Portland, Ore.
Sprint Nextel has launch its 4G mobile broadband service in Las Vegas, Atlanta and Portland metro areas. The service offers peak downlink speeds of more than 10 Mbps and average downlink speeds of 3 Mbps to 6 Mbps, three to five times faster than the 3G service offered by any carrier today, based on average download speeds, and without bandwidth caps, for $70 a month. If you are a typical 3G user the unlimited service won't mean that much. Few 3G users use anywhere near the 5 Gbyte monthly cap, costing $60 a month. Heavy video users might want to consider it, though. The additonal bandwidth is more than adequate for quality video viewing, and the lack of a cap means you won't have to worry about blasting through your cap. Of course, the decision also depends on where you live, and where you use mobile broadband. If you are a road warrior, the coverage simply isn't wide enough to be of exceptional use, though the modem also will allow you to use the Sprint 3G network anyplace there is 3G service. For users who normally use 3G, Sprint Nextel offers a $10 a day pass that allows 4G access when a user is in an activated market. Broadband access providers rightly are concerned that their big broadband pipes over time will allow users to bypass service provider voice and video services, and DirecTV just fired a limited shot in that direction. Though direct competition from Hulu and other sites is a bit muted since those services typically make sure online content is not made available at the same time the same content is showing on the linear networks, the new Sunday Ticket package will do precisely that. Though I frankly don't know how DirecTV is going to ascertain which consumers, in which locations, actually cannot get a DirecTV signal, users who are in that predicament will be able to buy the National Football League "Sunday Ticket" package as a stand-alone, without paying for a subscription to DirecTV's other linear video offerings, and have that programming delivered over their broadband Internet access connections. There will be some locations where landlords or property associations may not allow satellite dishes, which might be easier to ascertain. But it will be harder to determine, without a site visit, where direct line of sight is not available. The new offering is an "over the top" service that does not require DirecTV to pay a cent to the broadband access providers whose access services are used to support it. The package will sell for $349, $100 more than most DirecTV subscribers pay. Generally speaking, potentially-disruptive innovation in the mobile business happens when a smaller provider launches new assaults. That appears to be the case in the German mobile market, as Telefónica's O2 Germany business launches mobile Internet packages that allow users total access to VoIP services at no extra charge. The operator is pushing two data plans in particluar: Internet-Pack-M and Internet-Pack-L. Pack M gives the subscriber a data limit of 200 MB per month for 10 euros. The larger plan, Internet Pack L, increases this limit to 5 GBytes for 25 euros a month. Neither of the plans actually cuts users off when they hit those limits, but connection speeds are reduced. The issue in the U.S. market is probably when, not "if" some provider ultimately will decide to take that gamble as well. And it might not even be an upstart provider, though that likely makes the most sense. At some point, leading providers with their own termination facilities and backbone networks might well conclude that it makes sense to do so. When AT&T launched its "Digital One Rate" plan, which eliminated the distinction between local and long distance calls, it revolutionized pricing industry wide. Sprint Nextel and Clearwire would seem perennial candidates to launch a disruptive attack, in part because they have no landline voice revenues to cannibalize. That was one reason AT&T thought Digital One Rate would work (before its acquisition by or merger with SBC Communications, AT&T had no significant local access customers, and none supported over owned facilities). Right now the leading providers probably are right in concluding they are better off avoiding such disruption. Voice revenues still are too important to risk. But that will change with time. And then an O2-style move will make more sense. Qwest Communications is a laboratory of sorts for incumbent telcos that do not have the resources and customer heft to justify launching IPTV services. Many small, rural telcos with small subscriber bases find that most customers already subscribe either to a satellite TV service or a competing cable TV service, for example. Qwest has decided to rely on partner DirecTV for its multi-channel video offering, but has been interested for years in ways to use its broadband access plant to supplement linear TV with true video-on-demand services. Now that Qwest has upgraded many of its metro networks to operate at 40 Mbps in the downstream, with plans to serve 23 metro markets with services that fast, we might finally see some movement in that direction. That would have important ramifications for many smaller and independent firms as well. If it works, if revenue for a true VOD service, built in conjunctionw with DirecTV does prove financially interesting, the same approach can be taken by many smaller operators as well. That is not to say IPTV cannot work. AT&T and Verizon are prime examples of firms with enough customer base and resources to do so. And many indpendent telcos have concluded that IPTV still makes sense. But IPTV remains a tough proposition for many smaller providers. On-demand video might offer a solution. But Qwest likely will be the key test of that theory. Qwest's approach also might prove helpful if cannibalization of linear multi-channel video actually does start to happen on a significant level. In that case, Qwest will have preserved scarce capital for robust access bandwidth upgrades, and then will be in positiont to push ahead aggressively with a VOD plan without risk of cannibalizing its linear video base. That would challenge the conventional wisdom, which is that a stand-alone VOD effort will fail without the ability to offer linear TV as well. Of course, Qwest already has that covered, with its DirecTV partnership. BT is rolling out 20-Mbps broadband access services to about 40 percent of its network terminations, up from 8 Mbps possible before BT upgraded many of its Digital Subscriber Line Access Multiplexers to the ADSL2+ standard. Actual connection speeds people will see will vary based largely on the amount of metallic cable between their home and the telephone exchange, as always is the case for DSL. Speed increases will be most noticeble in the upstream direction. Most BT retail customers connect at up to 448 kbps on the upstream when using ADSL, but this will double to up to 1 Mbps using ADSL2+. The new upgrades will be provided at no charge. Faster speeds are possible if a further upgrade to VDSL is made, but that also would entail deploying much more fiber in the network. And while BT faces criticism for not deploying fiber to the home, Fitch Ratings investment analysts say FTTH deployments are highly risky for European service providers facing cable operators. Fitch analysts estimate a telco FTTH upgrade in the U.K. market might cost BT about six times more money per connected home than it will cost cable operators to upgrade using DOCSIS 3.0. The obvious risk there is financial return. In a competitive sales environment, BT likely could not charge six times more for its offering than a cable operator would. For that reason, Fitch analysts say fiber "to the curb," which costsly significantly less, will be the preferred upgrade strategy. "FTTH is not commercially viable for much of the incumbents’ networks," though some greenfield builds will be feasible, Fitch Ratings argues. The point is that Fitch believes wide FTTH deployments are highly risky for European telcos facing serious cable competition. The broader point is that though fiber to the home likely is the "best" access technology in terms of bandwidth, it is highly financially risky, because the incremental revenue might not cover the incremental cost of the new facilities. It is one thing to mandate national broadband policies. It is quite another thing to require service providers to make investments that are demonstrably highly risky. That said, there are financial risks either way. Underinvest and telcos are vulnerable to cable operators taking dangerous amounts of market share. Overinvest and a return is not assured. All that said, actual facts on the ground are decisive. FTTH is more feasible where densities are high and where there is lots of aerial plant, compared to underground. The reason is that it is cheaper to rebuild aerial plant than underground plant. High density helps because loops are shorter and more shared infrastructure can be used. Shared infrastructure always is cheaper than dedicated infrastructure. But cable operators face the same general financial problem. As fiber is pulled closer to end user locations, the cost rises dramatically. At some point, after DOCSIS 3.0 is deployed and bandwidth is reclaimed by moving to digital video, raw bandwidth might still have to be increased. And that is going to take significant capital investment. For the most part, then, copper drops of one sort or another are likely to be with us for quite some time. National Broadband Plans Not That Effective? As the Federal Communications Commission starts work on creation of a "national broadband plan," it is worth keeping in mind the relatively slight impact such policies have. In fact, 91 percent of the differences in fixed broadband adoption rates in the 30 Organization for Economic Cooperation and Development member countries can be explained by reference solely to differences in income, education, population age, and other demographic factors that bear little relationship to broadband or telecommunications policy," the Phoenix Center for Advanced Legal & Economic Public Policy Studies. says in a new study. In fact, perhaps 87 percent of the variation in broadband subscription rates across the OECD can be explained by a few inputs. On average, a $10,000 increase in gross domestic product per capita increases the connection rate per capita by 1.97 percentage points. A 10 percentage point rise in the percentage of a population living in an urban area, or a 10 percentage point decline in the share of persons over 65 years of age, both increase the subscription rate by about 3.0 percentage points, on average. Beyond, one of the deficiencies of the OECD study is that it does not include other popular methods used by people for Internet access, such as at libraries and public Internet connection centers, for example. Nor do OECD studies include mobile Internet access, a more-serious problem as mobile connections grow. Fully 56 percent of Americans saying that have "at some point used wireless means for online access," according to researchers at the Pew Center Internet & American Life Project say. Notebook PCs are the main way most Americans get online wirelessly, with 39 percent saying it is their "most prevalent means of wireless access," and 32 percent saying they have used a cell phone "or other hand-held device to check e-mail, access the Internet for information, or send instant messages." More important, 69 percent of Americans also are also starting to use their cell phones for texting, e-mailing, getting directions, snapping and sending photos, Pew says. Ignoring mobile broadband access under such conditions is a major flaw. "Mobile broadband is likely to be very important for users who do not own or know how to use a computer, since Internet access is also possible through smart mobile phones and other small, portable devices such as Netbooks," the Phoenix Center says. "Indeed, broadband provided over mobile networks may replace fixed connectivity for many users." In Portugal, for example, more than half of all broadband connections use mobile technologies, and 10 percent of broadband connected persons in the country use only a mobile access method. Are Younger Users Cooling to Social Networking? U.K. communications regulator Ofcom says the percentage of 15- to 24-year-olds with a profile on a social networking site has dropped for the first time, from 55 percent at the start of last year to 50 percent this year. Some have suggested this means younger users are abandoning sites such as Facebook that no longer are attractive now that their parents use the sites as well. The other explanation is that users are starting to settle in at fewer sites, says comScore. Younger users are increasingly moving towards Facebook as their primary social networking destination, and using other sites less. It's always hard to get users to change their habits. That is one reason media and content companies spend so much time and money on promotion and marketing. And it appears that applies to the ways people find content as well. According to comScore, one obstacle the Yahoo!-Microsoft partnership faces is changing user habits. The reason is simply habit. Users who search on Google tend to stick with Google for most searches, comScore notes. About 69 percent of users conducted their searches on Google-owned sites. Users of the engines at the combined Yahoo! and Microsoft Sites conducted 32.6 percent of their searches on the combined Yahoo! and Microsoft Sites, but a much higher 60.7 percent of their searches on Google sites. In the content business as well as in the real world, friction and inertia require inputs of energy to "force" objects to change direction. More U.S. Mobile Internet Than PC Users by 2010? "By 2010, the number one way U.S. users will interact with Web is through the phone, not the PC," says Rodney Mason, Moosylvania CMO. That would be a huge change, more in line with what forecasters have been predicting about Internet access methods in the developing world. If it turns out the mobile device becomes the most-common means of access, the way Web applications and services are designed also will start to change. Smart phones and mobile broadband networks should lead to "TV everywhere" services, for example. And that could break the hold multichannel video services have on the delivery of video. Sales of smart phones matter for several reasons, among them the creation of new markets for mobile applications. Handset suppliers and mobile service providers have a huge stake as well. Nearly a quarter of all handsets sold in the U.S. market during the fourth quarter of 2008 were smart phones, up from 12 percent of all phone sales in the same quarter of 2007, according to the NPD Group. But the rate of growth seems to have slowed because of the recession. IDC forecasts a U.S. smart phone growth rate of between four and five percent for 2009, a far cry from last year’s 68 percent growth, and Stela Bokun, Pyramid Research analyst, warns that slowdowns in Europe and other markets could negatively affect service provider data revenue growth. 'If smart phones do not get cheaper and if mobile customers remain the only ones bearing the risks related to currency fluctuations in individual markets, uptake will suffer in a prolonged recession and post-recession data services revenue will take longer to recover," she says. Of the 263 million new handsets sold in Europe in 2008, 14 percent were smartphones. These 36 million units accounted for roughly 24.4 percent of all smart phones sold globally that year, Bokun says. "We expect handset unit sales in Western Europe to fall 20 percent in 2009; the situation is even worse in Central and Eastern Europe, where new handset sales are expected to fall 25 percent this year," she says. Globally, Nokia leads in sales of new smart phones, while Research in Motion is second and Apple is third. Nokia sold 18,441,000 smart phones in the 2nd quarter of 2009, and RIM sold 7,678,900 unit, while Apple sold 5.4 million devices. Perhaps the biggest first round winners of broadband stimulus grants, after the close of application deadlines Aug. 14 or Aug. 20, 2009 (larger projects will have the Aug. 20 deadline by virtue of an extension granted for electronic filers) are wireless providers, especially firms using terrestrial broadband for access. There are several reasons. Wireless networks can be built faster, at lower cost, than wired networks, giving wireless providers a better chance of completing larger projects in the required time frame. The largest wired service providers seem to have decided not to apply, for a variety of reasons having to do with the way the rules are constructed and strings attached to receipt of funds. Also, existing wireless providers, especially independents, have the infrastructure and business acumen required to run such networks, and huge incentive to build out their networks. In the last major investment wave in the U.S. telecommunications market, though there were hundreds of upstart firms launched, most market share was controlled by just tow companies, AT&T and MCI. Since it appears the largest carriers will sit out the broadband stimulus program, the field is cleared for medium-sized firms to get the funding. Most of those companies, even those building new middle-mile optical trunking facilities, will rely on wireless for the final mile connections. Zer01 Mobile says it has severed its business relationship with Buzzirk Mobile for distribution services, based upon breach of contract. It isn't immediately clear what impact the termination will have, as Zer01 is a mobile virtual network enabler and can supply its unusual and interesting approach to mobile voice to other distributors, but Buzzirk seems to have been the most-active of the MVNO marketing partners. What remains interesting is the approach Zer01 has taken to creating its "VoIP over mobile" capabilities. Essentially, the company uses what it says are national interconnect agreements with GSM providers, and VoIP from VoX to create its service, instead of the traditional MVNO route whereby customers buy wholesale capacity from networks, repackage and resell those capabilities. Zer01's approach has been to establish itself as a "carrier" for purposes of interconnection, which allows it to exchange traffic with other carriers using the industry-standard rules without buying capacity on one or more networks to resell. It remains an intriguing approach, though the effort has been clouded by some controversy, which Zer01 now appears to want to put behind it. Zer01's corporate parent is privately held, and has no obligation for the fuller reporting a public company must provide, but a bit more transparency would not hurt, one might argue. One of the frustrations many of us have with governments substituting themselves for the market is that nobody is smart enough to figure out all of the unanticipated consequences. Without making any judgments about the broader theory of pump priming Keynesian theory suggests now are appropriate, externalities seem the order of the day. The undeniably popular U.S. cash-for-clunkers program may be drawing money from other consumer purchases and could also undermine future car sales, U.S. economists now warn. The latest Commerce Department retail sales figures show U.S. retail sales fell 0.1% in July, as opposed to expectations sales would gain 0.8%. Excluding autos, retail sales declined 0.6% versus an expected gain of 0.1%. Joshua Shapiro, chief US Economist at MFR. “Anyone thinking about buying cars in the next several months might as well do it now when the government is giving away $4,500,” he says. One wonders what other sorts of externalities now are occuring elsewhere in the economy, and will happen when broadband stimulus funds start to flow sometime in early 2010. Will Broadband Stimulus Work, If So, How Well? An argument can be made that the "broadband stimulus" program, which has yet to award its first funds, will change very little. Most people who use the Internet already buy broadband services. People in "underserved" areas might already have several providers (wired and by satellite and terrestrial broadband); the real barrier being lack of PCs, lack of training or simple lack of interest. In rural areas, there are perhaps hundreds of thousands of locations with no terrestrial access at all, though satellite service might be available. An argument easily can be made that funds should be focused on locations that literally have no terrestrial access at all. But those locations will be expensive to reach, meaning fewer households will benefit. Also, building facilities will only improve broadband usage to the extent those new locations have consumers who want to buy broadband. A good percentage will not want to, because they don't use the Internet, do not own computers or cannot afford the incremental cost of broadband service. That said, even if funds are targeted very precisely, overall broadand usage in the U.S. market will not change much, if only because the number of new subscribers in rural areas will, by definition, be limited. Even in most rural areas, an overwhelming majority of locations already are reached by one or two wired networks, plus satellite and terrestrial broadband in many cases. The number of truly isolated locations is quite limited, in comparison to all U.S. locations and current broadband subscribers. Good policy reasons underpin the drive to connect the unconnected. But a "passing" (facilities are in place) is not the same thing as "a user" (a household that buys service). It's good to build facilities to isolated locations. But that doesn't mean people always will buy, or that the number of new subscribers will move the needle. Microsoft and Nokia are working together to bring native versions of Microsoft Office to Nokia smart phones, in a challenge to Research in Motion. Over time, the companies plan to release applications for Nokia phones (using the Symbian operating system) that include the ability to view, edit, create and share Office documents on more devices in more places with mobile-optimized versions of Microsoft Word, Microsoft PowerPoint, Microsoft Excel and Microsoft OneNote. The initiative also includes enterprise instant messaging and presence, and optimized conferencing and collaboration experience with Microsoft Office Communicator Mobile. The collaboration also will lead to mobile access to intranet and extranet portals built on Microsoft SharePoint Server. Apple and Android Gaining, Nokia and Microsoft Losing Share in Smart Phone Market? Worldwide mobile phone sales totalled 286.1 million units in the second quarter of 2009, a 6.1 percent decline over the year earlier quarter, but smart phone sales rose 27 percent over the same period, surpassing 40 million units for the first time (40.96 million), says Gartner research director Carolina Milanesi. Apple saw the largest rise in its share of the global smart phone market, rising from a 2.8 percent share in the second quarter of 2008 to 13.3 percent in the same quarter of 2009. Apple is the third most popular provider of devices, with Nokia number one, despite losing new sales share from 47.4 percent to 45 percent. Research in Motion is third. In the area of operating systems, Nokia's Symbian has 51 percent installed base share, down from 57 percent a year ago, while RIM and Apple grew their shares year-on-year. Google's Android platform accounted for just under two percent share in the second quarter. Microsoft's share continued to drop year-on-year to account for nine percent of the market in the second quarter. New technologies, especially those that arrive in the enterprise space from the consumer space, eventually reach some point where corporate managers feel the need to establish policies that serve enterprise business requirements. In the latest example, ESPN has issued 12 guidelines to its employees about social networking. The guidelines say that on-air talent, reporters and writers are prohibited from having sports-related blogs or Web sites and that they will need a supervisor’s approval to discuss sports on any social networking sites. “The first and only priority is to serve ESPN-sanctioned efforts, including sports news, information and content,” the new rules say. Violating the new guidelines could lead to suspension or dismissal. Similar struggles occurred when mobiles started appearing in the workplace, when email started being used and when Web access moved into the workplace as well. In many cases, employees tried blanket prohibitions, before gradually figuring out how to protect business information and interests while still allowing employees to use the new tools. The same will happen with social networking tools. In 2008, 49.6 percent of U.K. retail revenues were earned providing mobile and data services, while 33.8 percent of revenues were earned from fixed and mobile data services, says Ofcom, the U.K. communications regulator. The long term challenge is that even a majority of current mobile voice revenues are likely to shrink as mobile VoIP services become more widespread. That doesn't necessarily mean voice usage has been falling. Instead, we essentially have productivity effects, as the per-unit cost of using voice has fallen as volumes have grown. That doesn't necessarily mean voice revenues will disappear, but that voice will be a smaller percentage of total revenues on both the fixed and wireless networks. And though mobility has been the revenue source primarily responsible for telecom providers managing the transition away from classic fixed voice, that will not always be the case. Mobile voice revenue growth has slowed significantly as penetration has saturated and prices have fallen. Mobile voice revenue growth was just 1.6 percent in 2008, compared to an average of 7.7 percent annual growth over the previous five years, Ofcom says. annual average of 9.6 percent growth over the previous five years and 15.5 percent over the previous ten years. fallen by 26.9 percent in nominal terms from this peak to £9.0 billion by 2008. Growth in mobile voice revenues, which more than tripled from £3.6 billion to £11.5 billion between 1998 and 2008, ensured continued growth in total voice telephony revenues until 2008, when they declined for the first time. All of that is important for one salient reason. Some have argued that telecom providers would collapse as their core businesses were undermined by new IP-based alternatives. And while the danger remains, so far service providers have proven adept at creating new replacement services and applications at nearly the pace the legacy revenues are falling. The possibility of disruption exists, of course. But at least so far, telecom providers have proven themselves rather more adept at structural change than many had expected. IP is disruptive to many industries. Whether it is fatal remains to be seen. Is Apple's Business Model About to Change? Though it remains for the moment an unanswerable question, it is probably not too early to ask whether Apple's business model might change in the future, and at what pace. Until recently, virtually all of Apple's profits were built on hardware sales. Everything else, system software or iTunes music revenue only mattered as a way to drive hardware sales. The iPhone and iTunes are the best examples of how and where the change might come. Apple might make $200 to $300 or so selling an iPhone, but $600 to $850 is more like the additional service revenue Apple receives from an AT&T iPhone sale, the difference being the value of the recurring service revenue Apple gets from AT&T, some analysts say. For the 2009 quarter ending in June, Apple sold 5.2 million iPhones for a recorded revenue of $1.7 billion, or about $324 per iPhone.But iPhone-related service revenue was about$4.4 billion, compared to $3.3 billion in Mac sales. So at least for the moment, iPhone service revenues are a bigger revenue contributor than the Mac PC product line. One wonders what will happen if Apple gets into the e-book reader business. What percentage of revenue might be earned from selling readers, or iPhones, compared to the recurring content business? Apple could become a distributor and micro-payment agent for goods and services. All of this remains speculative, of course. It is not clear Apple always will be able to claim some portion of service provider revenues. But other content or application-related revenue streams might emerge to replace those recurring service revenues. Piper Jaffray analyst Christopher Larsen has cut his rating on Sprint Nextel, arguing that industry dynamics have shifted significantly over the lat two to three months. The trends of most importance are the higher subsidies service providers are providing on handsets as well as lower prices for attractive pre-paid offers that are likely to put pressure on postpaid pricing, especially as more data intensive handsets become available at lower price points. The other trend of note is that although the prepaid business has traditionally been viewed as a segment comprised of lower-income or credit-challenged customers, that is likely to change. Already we see more smart phones available for use on prepaid plans, a departure from past practices. To be sure, mobile service providers will continue to use handsets as a differentiator, but wider availability of capable handsets used with pre-paid plans seems inevitable. At the same time, $45 and $50 prepaid plans that also feature unlimited usage are going to destabilize postpaid pricing. employees for disclosing confidential, protected or simply embarassing information put up on socialnetworking sites such as Facebook or LinkedIn, up from four percent who reported doing so in 2008. About 17 percent of respondents said they had incidents of that nature this year, compared to 12 percent in 2008. But email still seems to be a more-common reason for terminations of this sort. About 43 percent of respondents reported they had investigated an email-based leak of confidential or proprietary information in the past 12 months. Nearly a third of them, 31 percent, terminated an employee for violating email policies in the same period, up from 26 percent in 2008. About 18 percent of respondents say they had investigated a data loss event from a blog or message board in the past 12 months. About 17 percent disciplined an employee for violating blog or message board policies, while nearly nine percent reported terminating an employee for such a violation, up from a disciplinary rate of 11 percent in 2008 and a termination rate of six percent in 2008. More respondents also reported investigating video-related exposure events. This year, about 18 percent have had to do so, up from 12 percent in 2008. About 15 percent of respondents have disciplined an employee for violating multimedia sharing or posting policies in the past 12 months, while eight percent reported terminating an employee for such a violation. investigated an exposure event involving mobile or Web-based short message services in the past 12 months. About 38 percent of respondents say they now read or analyze outbound email before it is sent. embarrassing information (34 percent, up from 23 percent in 2008), an increasing number say they employ staff to read or otherwise analyze the contents of outbound email (38 percent, up from 29 percent in 2008). exposing its contents to outside scrutiny. Nearly a quarter (24 percent) of large US companies report that employee email was subpoenaed in the past 12 months. Service providers, end users and policy advocates will be keeping close watch on Malaysia's open access fiber network Jalenasn which will begin building as early as October, says Comms Day International. Based on an open access model, Jalenas will only own and control the fiber infrastructure, leasing access instead to broadband service, applications and content providers who in turn will offer end user services. The model probably is not directly applicable to U.S. markets, in part because measurable government support is required, in part because of massive service provider opposition. But the plan will provide new real-world data about the economics of such methods, which require extreme operational efficiency by the infrastructure provider. A similar wholesale access approach is being undertaken in nearby Singapore, and both Australia and New Zealand are weighing somewhat similar approaches as well. The Jalenas network is owned by Pahang state-backed High Speed Broadband Technology. Ericsson will manage the project for at least the first five years, in yet another new twist. The Malaysian access network will be owned by one entity, managed by another, while retail services will be provided by other third parties. FairPoint lobbyists and officials say the University of Maine System is unfairly competing with them for federal funds available as part of the American Recovery and Reinvestment Act "broadband stimulus" program. Jeff Letourneau, the associate director of information technology at UMS, said the proposal is not the university’s but is from a private-public partnership and that the UMS is just one member. FairPoint is developing a $20 million proposal that builds on its existing Internet infrastructure, the company indicates. FairPoint says the project will bring broadband access to 90 percent of Maine by 2013. Though the first of the funds have not yet been awarded, organizations and companies now are starting to complain about the rules. FairPoint Communications, librarians and FiberNet in West Virginia are among those who have voiced complaints about the rules. Video Tipping Point in 2010? The mass-market tipping point for online video will occur in 2010, when online video will be viewed by 50 percent of U.S. consumers, says eMarketer. Online video also will achieve a 59 percent penetration rate in 2013, up from 47 percent in 2009. The number of U.S. online video viewers will grow to 188 million in 2013, up from 144 million in 2009, says eMarketer. Online video viewers will make up 85 percent of Internet users in 2013, up from 72 percent in 2009. “This will put online video within range of Web activities such as search and e-mail, which are nearly at saturation points among U.S. Internet users,” says Paul Verna, eMarketer senior analyst. The ability to share video through social networks, blogs, microblogs, e-mail and other social platforms will play a role. So will mobility. All of that will hasten the day when changes must be made--especially on mobile networks--relating to end user consumption and pricing. Is the USPS a Natural Monopoly? Just thinking out loud, but is mail a natural monopoly? The U.S. 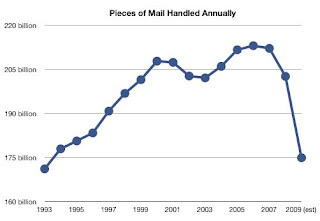 Postal Service has seen a precipitous drop in volume lately. So they raise their prices, making other alternatives more attractive, which further depresses volume. It sort of looks like a death spiral. Of course, "mail" can mean messages, so email is a functional substitute, as was facsimile. And mail and packages can be delivered by any number of competitors (FedEx, UPS and others). To the extent that FedEx, UPS, the Internet and other alternatives aer widely available, perhaps "mail delivery" is not a natural monopoly. Still, without large subsidies, the network is not profitable. It could not provide universal delivery without subsidies and it certainly does not ever make money. So it is one of the other models one has to look at when thinking about the future of the communications network business. Affordable Smart Phones Next Big Thing? Google Voice "Not Really VoIP"? YouTube Adds "News Near You"